Most people familiar with search engine optimization are well aware that linking to outside websites of bad quality can actually hurt your own site in Google’s eyes, but most people are completely unaware that bad websites linking to your site can actually hurt you, too. This is a relatively new concept for Google, since before the Penguin update it only took into account low quality outbound links. Now that every link, inbound or out, affects your Page Rank score, we must be vigilant in tracking who is out there linking to us. Knowing who’s linking to you is one thing, but doing something about it is something else entirely. Luckily for us, Google took care of the problem with last year with a new addition to their Webmaster platform called Google Webmaster Disavow. Like many Google products, it’s very self descriptive — the tool disavows incoming links that you from “counting” towards your final Page Rank score. And even more like other Google products, it’s very intuitive to use. Before you get started, it’s important to mention that you might not actually need to do this. If you only have a few bad inbound links coming in here and there, you’re probably fine. But if it becomes a pattern &mdash with or without your consent &mdash then you should take action. Google doesn’t care about bad site links as much as it cares about maintaining the integrity of the web. If it detects a shady link-building strategy, it can mean a substantial hit to your web traffic and visibility, not to mention eventual blacklisting.
. If you haven’t yet bad a Webmaster account, first go to and create one before you get started. Once there, the instructions are very easy to follow, although the first page is somewhat misleading, which may cause some confusion. It seems like it’s asking you to select a site from the dropdown to disavow, but it actually wants you to select a Webmaster profile associated with your Google account to add this disavow command to. 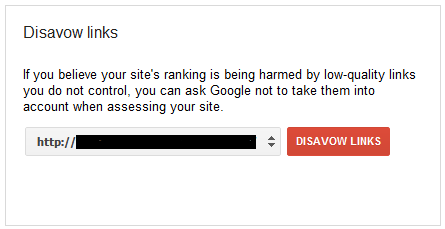 Select the correct Webmaster domain profile, then hit “Disavow Links”. The second page is again somewhat ambiguous, but to put it simply, it’s just a confirmation page. Hit the “Disavow Links” button once again to continue. Finally, you will be prompted to submit a text file (.txt) with the URL’s that you would like Google to ignore when calculating your PageRank. Use any text editor to create this, and be sure to put only one URL per line. Once you’re finished, save, then upload your document. If it uploads correctly, it should be added to the “Disavowed Sites” list. Great work — you’re done!